School Management Software (SMS), that simplifies administrative management, academic management and financial management of a school. It is used by thousands of educational institutions worldwide for all administration, management and learning related activities like admission, fees, accounts, attendance, examinations and evaluations in a streamlined and accurate manner. Right from issuing of pre-admission forms to the announcement of cut-off list, followed by the new admissions and their subsequent fee submissions the features covered in our school ERP software help in streamlining every activity in the school. 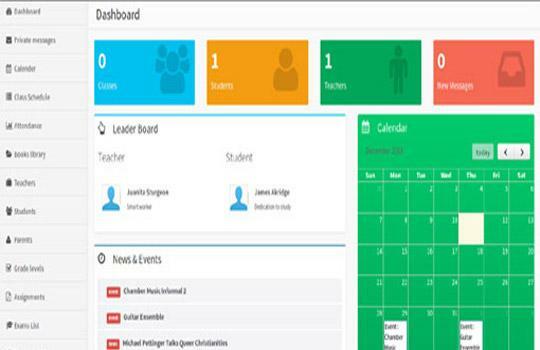 College and School Management System provides user-friendly dashboards with login access for teachers, students, parents. Keep tracks of attendance of students. Online query and online leave application. Teachers message if any . Holidays lists and school time table. ​Daily attendance and progress report of their kin. Prior information regarding school events and holidays. Online query and feedback systems.